Left to right Alejandra Torres, Roxanna Gonzaloz, Carolina Dominguez, and Vanessa Espitia represent the master's contingent of Revolution and Aero Soul. 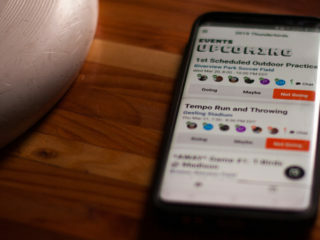 The one argument against gender equity in ultimate that gets me going every time I hear it always goes something like, “People won’t pay to watch women play sports.” The suggestion is that supporting women in professional ultimate is not economically viable because spectators will not show up to watch female-driven ultimate. This stance is baffling to me because women, indeed, people (no need to gender discriminate here) are endlessly fascinating once you learn more about their personal stories. More than athletic play, it’s the stories behind favorite teams that create a loyal fan base. Currently, ultimate is usually shared through live stream, typically with little colour commentary. We hear nothing of the player’s stories, their personal challenges, or what drives them to compete. That’s why I find it so strange when I hear that women in sport are boring to watch. Of course, that is not true. As evidenced by the recent explosion in interest in gender equity, both in ultimate and in social politics internationally, the truth is that stories of female empowerment are compelling and there is a market for them. At PAUCC 2017, I made it my priority to search out amazing female leaders and find out more about them. I went looking for women’s masters players to hear their wisdom and learn from their experiences. But there was no women’s masters division at PAUCC this year. The number of women who play ultimate drops sharply as women get older. However, I didn’t have to look very far to find amazing women leading the way on and off the field. Canadian Leanne Johnson reels in a disc. Canadian Leanne Johnson may have some kind of superpower. She’s a pediatric ear nose and throat doctor. She has been a coach and captain for Salty, the Halifax women’s team, and, The Collective, the bronze medal-winning maritime women’s master’s team. Most recently, she was one of seven women representing in the open division at the 2017 Great Grand Masters Beach Championships. “What was so great about that,” she says, “is these are the same guys that I started playing within the open division. Now all these years later, I am back playing with the same guys again. It’s great.” And she does all this working, coaching, and playing, with her ultimate husband and her four kids (one set of twins, one adopted), while helping run their family vineyard. Just reading those last sentences makes me tired and confused, but not Leanne. “Ultimate is my happy place,” she explains. “I don’t want to be a captain anymore. I just want to play because I love it.” However, she has a pretty solid idea of what she expects from her captains. 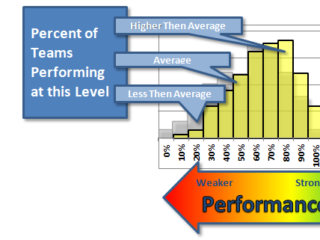 “A captain’s job is to look at the talent on the team, see where the strengths and weaknesses lie and match people up who are complimentary. I do not support the idea that to win you must play power line after power line.” She shudders at the memory of teams on which some players don’t see the field while others hog the disc. “If you bring a roster of 15, then you need to figure out how to use those players. 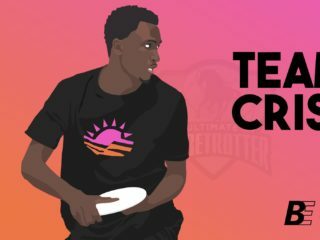 If you only play 10 of those 15, then as a captain, you didn’t do your job.” Leanne has never felt that there was a limit to what she could accomplish in ultimate. And from the looks of it, she’s right. Carolina Dominguez wearing a plaster cast after breaking her arm at PAUCC. Carolina Dominguez is a 12-year veteran and founding member of Aero Soul. She helped start the team that earned the number two spot in Colombia this summer. She has imagined quitting many times to devote more time to her family, but the strength of community in Aero Soul keeps her coming back for more. Her husband, we’ll call him Woke Bae, is a competitive ultimate player as well. Between them, they recognize that her ultimate career outshines his. Woke Bae made the decision to stay home with their child in the evenings to allow Carolina to lead her team. Aero Soul expects four practices a week from its roster, three together, and one solo training session. Then there are fundraising events to organize, and tournaments to play. “No, no. Because of gangs” she returns, her dark eyes speaking volumes. “Because of violence, we do not leave our children alone.” But Carolina, and many women like her, do not let anything keep her sidelined. These women work together to build community, a sense of family, and they foster the goals of the young women in their communities. Carolina is, for now, satisfied with the challenge of captaining Aero Soul. “When we started the team”, she explains, “no one knew what ultimate even was. We were learning from YouTube videos. Now, look at where we are.” She gestures to the vast field complex at the Pan American Championships. “We won second at the national championship this year and qualified to represent our country at PAUCC. It’s amazing we have come this far.” Sacrifice, dedication, discipline, and teamwork are elements that make her story resonate with so many other players and spectators out there who are working towards their dreams. Then there is Lourdes. This feisty mama of four grown kids has been playing for nine years in the Dominican Republic. She explains her ultimate beginnings. 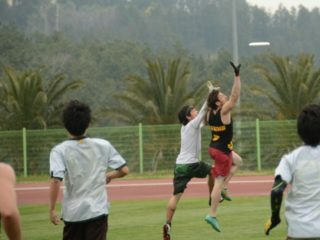 “When I started playing ultimate, there was no women’s division or women’s teams. The men wanted to include more women, so they recruited me to come and play in the open division. With them, I traveled to a tournament and got hooked. I never looked back.” At 51 years young, Lourdes Blandino seems to defy the natural course of aging. She catches me eyeing her hard-sided knee brace. “I have no lateral meniscus, no shock absorber for the knee. My husband thinks I am going to retire this year but I love the game. As long as I can still run, I will play.” Her confidence and commitment are palpable. “All my friends my age get together for walking or swimming.” She rolls her eyes, “I don’t want to be like that. I’ll golf when I’m 80.” Lourdes credits the men in the Dominican Ultimate community for working hard towards gender equity. She explains that, typically, men coach women’s teams, and that’s fine by her. She says, “Dominican women have sangra calliente and having a man around keeps the peace.” These days, Lourdes divides her time between mixed and women’s ultimate. The way she sees it, ultimate is always about everybody working together for success. Whatever elixir Lourdes is drinking, I need some too. Watching great women play ultimate is awesome enough already. But knowing how cool these players are in their lives outside ultimate only enriches the spectator experience. It’s incredible that Leanne Johnson works as a pediatric ENT doctor, has 4 kids, and operates a vineyard. Carolina and Lourdes’ dedication to sport is inspirational; listening to the depth with which Alejandra speaks about coaching definitely enriched my experience watching Revolution play. Ultimate isn’t perfect. It’s time we examine some of the invisible bias that limits the opportunities of female players. We can celebrate the achievements of both men and women, without having to tokenize women’s participation. Sharing inspirational stories is one way to show up for these phenomenal female athletes. 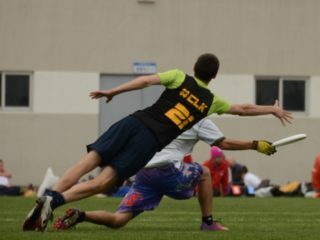 The story of how we play ultimate together plays out on the field and lands right in our hearts.